Open one of the windows listed in the Overview to the left, depending on the type of item appearance you want to modify. Align - Text can be left, center, or right-aligned. Text color - This is the font color. 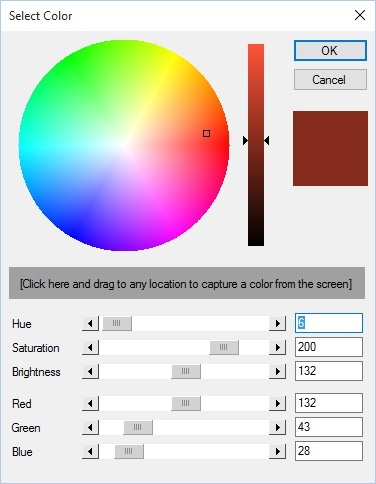 For this color property as well as the background colors, you can select a color from the drop-down list. You can also select a custom color. 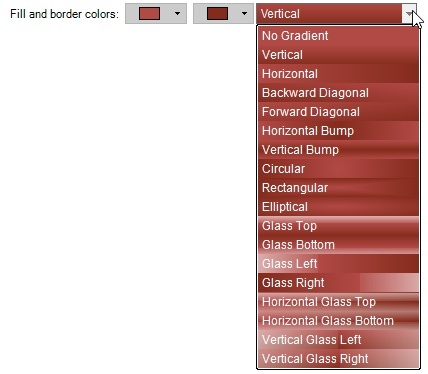 Clicking the "More Colors..." button at the bottom of the drop-down will result in the following window appearing, where a custom color can be defined. To define a custom color, click in the color wheel to select a hue. Next, adjust the brightness by dragging the arrow up or down in the slide to the right of the color wheel. A preview of the color will be shown below the Cancel button. If you see a color elsewhere on the screen that you'd like to use, click in the gray box in the middle of the window. The cursor will change to an eye dropper. Drag this to the desired color and then release the mouse button. The window will update to show the selected color. If you know the exact HSB or RGB values, those can be entered in the area at the bottom of the window. When finished, click the OK button to use the specified custom color. Fill and border colors - These are the background colors. You can select a primary background color as well as a secondary color. The secondary color will also be used as the border ciolor. The background colors will be blended together using the specified gradient style. If the gradient style is set to "No Gradient", the background color will be the first color and the border color the second. If you don't want to see a background color, you click "Transparent" in the drop-down. Gradient style - This is the gradient style to be used in blending the two background colors. It also serves as a preview of how events belonging to the calendar will appear using the current settings. To select or preview other gradient styles, click the drop-down button.